I asked Alison if she had a color scheme and theme in mind for her nursery. 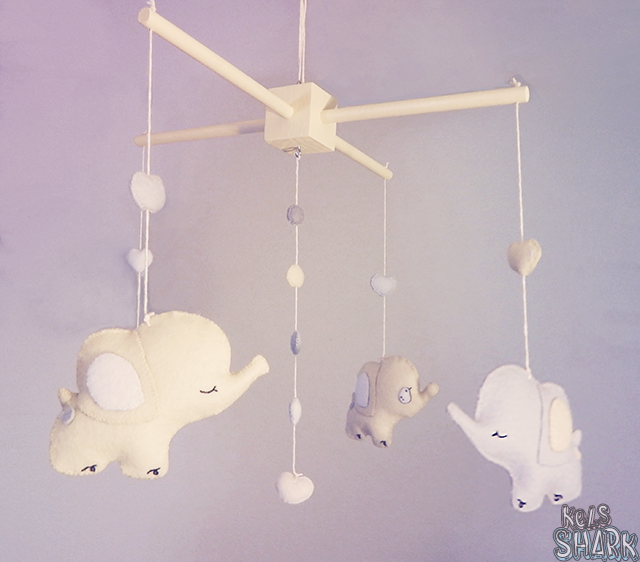 She mentioned that she was considering a yellow and grey nursery with an elephant theme: easy starting point. Let's talk about sewing. I haven't used a sewing machine since my high school's "life skills" class and it's one of my major crafting fears. Give me clay scrapbook paper, jewelry components, or spools of wire, and I feel pretty comfortable... but as soon as you mention sewing, I start hyperventilating. I wasn't feeling brave enough to open my sewing machine (yes, sadly, I own one and it's still in the box), so I decided to hand-sew. Baby steps, right? Luckily, I found Teacup Lion, the most adorable plushie sewing patterns shop I've ever seen! Laura, the super sweet owner and pattern-maker for Teacup Lion (I can't get over her shop name - it's so cute), offers plenty of patterns for novice hand-sewers like myself. 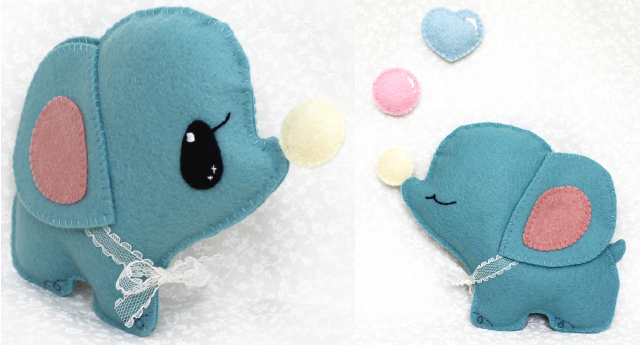 Laura's elephants and bubbles sewing pattern looked cute, relatively simple, and was very reasonably priced. Perfect! Looking up baby mobile tutorials and scouting out baby mobiles sold on Etsy, it looked like most people use either an embroidery hoop or a wooden x-shaped mobile frame. I liked the look of the frame, so I bought a painted mobile kit from Monkey Town Mobiles. You can also purchase an unfinished kit and leave as is or paint it yourself. Stephanie answered my questions about the mobile kit color quickly and helpfully. The mobile was my excuse to finally try out 100% wool felt, which is considered much higher quality than craft felt. 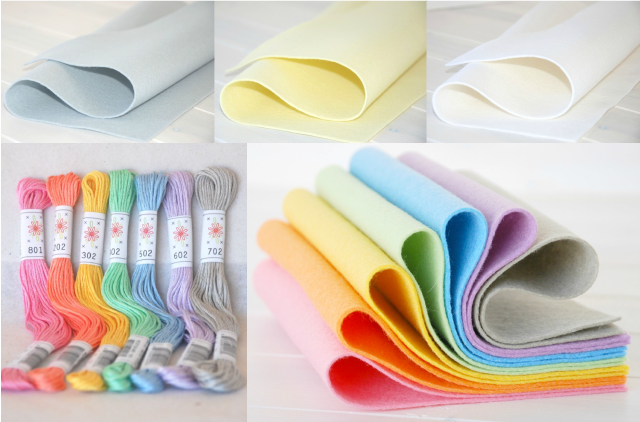 I bought five sheets of wool felt and a pack of pretty pastel embroidery thread from Crafty Wool Felt. I'm glad I went with the 100% wool felt - it cuts cleanly and was easier to work with than craft felt. It's also certified safe for babies, water repellent, fire retardant, biodegradable, and easy to clean! Want to try making your own baby mobile? You can, of course, substitute any pattern or color scheme to suit your theme. That's the fun of it! If you buy a kit, you'll need to glue it together. Monkey Town Mobiles includes easy instructions - just make sure to give the frame time to dry so that it's ready when you get to the last steps of the project. They recommend wood glue, which dries in an hour, but I used E6000 because I use it for everything. It's super strong, but it technically takes up to 48 hours to fully dry, so I did this step early on. If you're painting your mobile kit, you'll definitely want to allow it drying time as well. Since the pattern I purchased wasn't intended for baby mobiles, I shrank down the pattern by printing it somewhere between 50-60% of the original size. The printed elephants ended up measuring around 3" (7.6cm) tall. I just used regular printer paper but you could use cardstock to print your pattern if you'd like. Then, I cut out the pattern shapes from the paper. The only modifications I made were to lengthen the elephants' trunks just a bit, add a tiny heart on each of their bottoms, and skip the ribbon around their necks. Using the pattern you cut out in step one, lay down the pieces on the felt and trace with a pencil (or pen if you prefer). Take your time - it's important that your pieces are even so that they'll line up later on. It might help to think through what colors you need to cut out for each elephant ahead of time and write it out - it can get hard to keep track of when you are making four elephants. 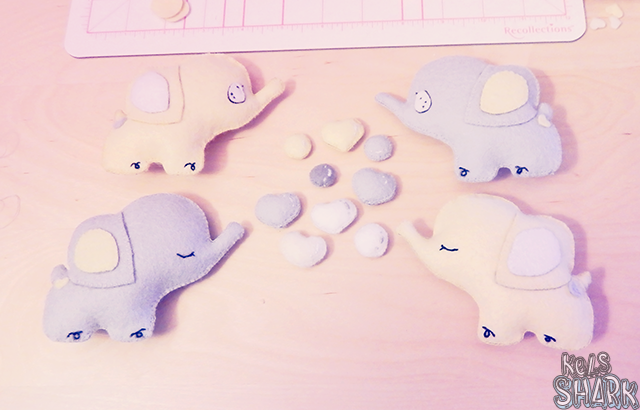 I made two yellow elephants (yellow body, white inner ear, grey heart) and two grey elephants (grey body, yellow inner ear, white heart). Don't forget that every elephant has two sides! Also, make sure to trace (but don't cut out) any parts of the pattern that require embroidery, such as the closed eyes, curves on the bubbles, and swirl on each elephant foot. 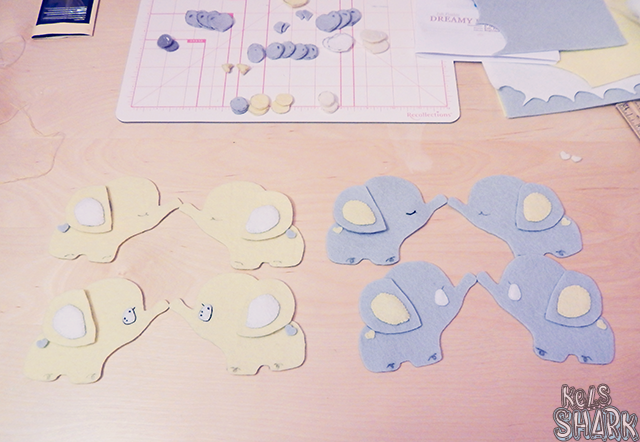 I decided to do one close-eyed elephant and one open-eyed elephant for each color, so I traced and cut out pieces accordingly. 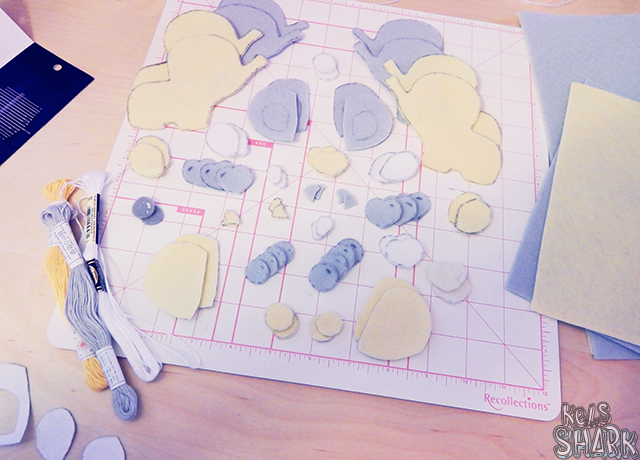 I placed and cut out my felt pieces very carefully, so I ended up only using half a sheet of baby yellow, half a sheet of silver, and a tiny bit of snow. Wherever there was a (relatively) substantial piece of leftover felt, I used it to make a bubble. Laura's instructions were easy to follow and detailed, including diagrams and explanations of all the different hand-stitches used for the pattern. Don't forget to sew and embroider everything you'll want on each side of the elephant before sewing together the two halves. The elephant tail was the last thing I sewed on each elephant and it was so small that I couldn't get the stuffing in, so I used tiny leftover scraps of wool felt to stuff them instead. 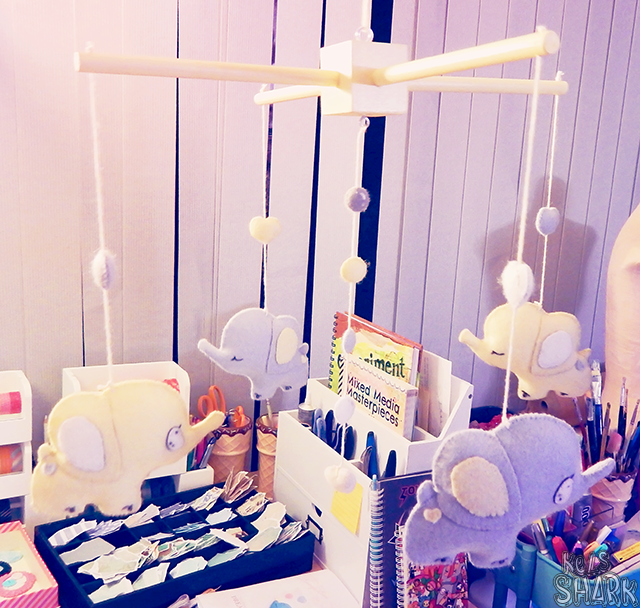 Step 5: String up your elephants and bubbles! 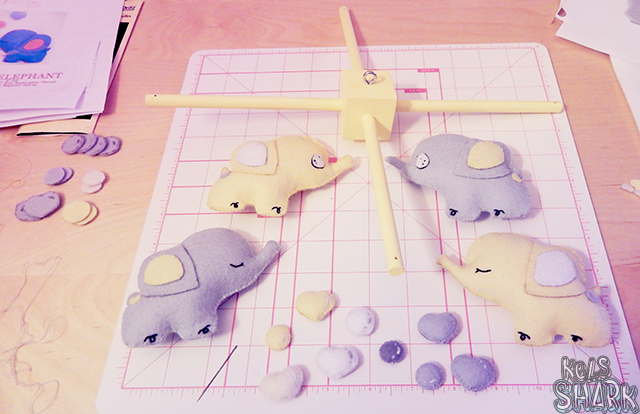 I used one of the larger needles from the assorted needle pack to poke a hole in each elephant's head (making sure it went through both sides), placing it just a bit above each elephant's ear, around the center of each elephant's balance. I threaded a piece of baker's twine through each hole and tied a tiny double knot to secure it, then cut off the excess. Then, I threaded the baker's twine (now attached one one side to the elephant) through a large needle. I poked this into the bottom of a bubble and out the top of the bubble to string it up. The twine was thick enough that the bubble could move up and down if pushed, but wouldn't fall down of its own accord. I allowed the twine to drop 6.5" (16.5cm) from the top of the elephant to the bottom of the mobile arm. Then, I strung the end through the hole in the mobile arm, tied multiple knots to secure it, and cut off the excess. For the middle string (bubbles only), I used the same method as the elephants, but made sure it dropped down to fall around the same height as the bottom of the elephants. Whatever pattern you go with, just play around with the string heights and placement of every element before tying everything in place! VOILA! Your baby mobile is done! I wrapped up the completed mobile in tissue paper and sealed it with a "made for you" sticker that I won in a giveaway by Susie. Stuck everything into a cute elephant gift bag from Papyrus and added this adorable card from Little Low Studio. My boss loved her gift! She sent me a picture of the mobile hung up and looking cute in her baby's nursery. I didn't know if Alison would prefer to hang the mobile from her baby's crib or the ceiling, so I didn't include any hanging hardware - I left that decision up to her. If you are making the baby mobile for yourself, be sure to look up how to safely mount up a mobile. This was a very time consuming project (20+ hours). My end pictures are not the best because I finished it late the night before the baby shower and didn't have time/energy to set up good lighting. I have a lot of respect for the Etsy vendors who have beautiful baby mobile pictures, because it's really freaking hard to get a picture of something that is designed to move constantly! Haha. Don't let me scare you off - it really was a lot of fun! 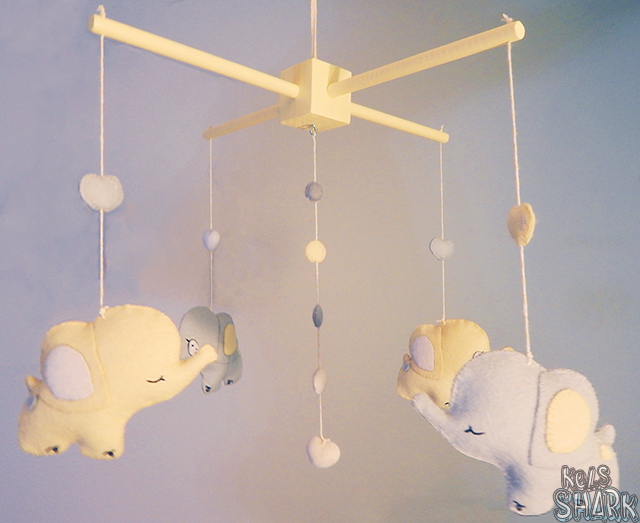 The nicer baby mobiles I found on Etsy ranged from around $90 to $200, so if you have time, making your own can be fun and save you a bit as well. It definitely makes for a lovely, unique baby shower gift too.